I love Social Media. I really do. I know - shocker, right? I love it so much that I wrote a love letter to it ... take a peak! But, one of the toughest things I personally encounter with the Social Media world is the idea of "Keepin' Up With The Joneses." I think we all know what that refers to right? 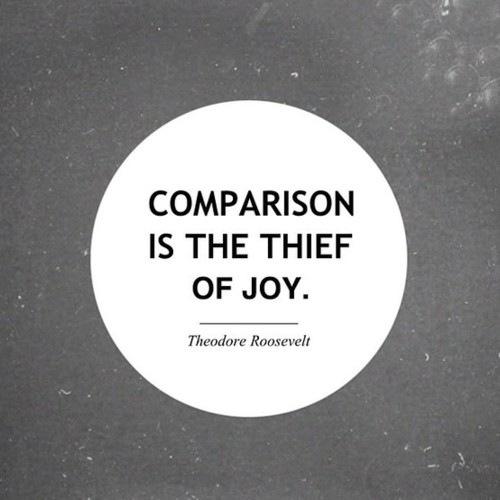 Constantly comparing our own journey to someone else's. I fall in to this trap ALL. THE. TIME. Many times I will catch myself reading a blog post or I catch a tweet where I just lose it. I sometimes feel like I don't deserve to share my journey because I'm not someone who has shed over 100 lbs or I didn't go from couch potato to a sub 3:30 marathon runner. I can come home from a run and be super psyched that I ran at a sub 8 min/mile pace (because of how far I've come), but I can take the accomplishment away in 5 seconds if I read that someone just did twice my mileage and sub 7 min/mile pace. I'm not really good at anything. I am kind of just average at many things. I love sharing about my weight loss and how far my running has progressed since the first time I laced my sneakers up. So WHY do I lessen my accomplishments just because someone else did it better or faster or more eloquently?? During a walk this afternoon I thought: "How do I stop the comparison game? I just need someone to tell me." But I realized that there is no clear-cut answer. But there are a few steps I need to take. I may need to take them every time the comparison urge strikes me and that's okay. 1) Remind myself that I started blogging and being a part of social media for me. I needed the blog to release the emotions and hopefully help just one person realize they are not alone. Every single person on the planet is worthy of a slice of the internet if they wish. 2) I don't HAVE to be a 100-lb loser to be an inspiration. I was lucky enough to have my rock bottom or AHA moment before I got the to the point of needing to lose triple digits. For some reason, I get the feeling from the internet that you have to be a triple-digit loser to be a "success," but it isn't true. ANYONE taking the initiative to take control of their health should shout it loud and proud from the rooftops. 3) I need to stop comparing my behind-the-scenes to someone else's highlight reel. I am a person that shares the good and the bad of my journey, but not everyone does. So I need to take the information that people share with a grain of salt. 4) I need to realize there is more to the world than social media. :P I love reading about the lives of others and being inspired on a daily basis, but I am more than a twitter handle or a website. No matter what I have a group of friends and family that are there to keep me from getting swept up in the online world and keep me grounded in the real world. 5) My journey is my journey and their journey is theirs. I can only control what happens in my life and only I can control my thought process. So keeping a list of things I can be proud of handy will get me through those moments. Do you fall into the pitfall of trying to Keep Up With The Joneses? How do you stay in control?